The Walking Dead: Season 7, Episode 9 "Rock in the Road" Review – AiPT! Normally, the time between The Walking Dead’s midseason finale and its return to air is spent yearning to watch the show. Unfortunately, this season has been pretty bad so far. Will “Rock in the Road” be the start of the show’s return to greatness…or at least a step up toward mediocrity? Let’s dive in and find out. The episode opens with Father Gabriel gathering supplies in what appears to be a hasty attempt to flee Alexandria. He also manages to add “stealing food” to the long list of things he’s terrible at. Edward Scissorhands would have been quieter grabbing up canned goods in the dead of night. Once Gabriel had everything (and made as much noise as humanly possible), he got in a car and drove off. As the car pulls away, we see someone in the back seat sit up, which instantly brings to mind a well known urban legend about a driver being saved from a killer in the backseat of their car by a tailing motorist flashing their lights. I don’t know about you guys, but if I were the one behind Gabriel, my brights would definitely be remain off. Back at the Hilltop, Gregory proceeds to conduct himself like a former member of Trump’s cabinet, complete with disparaging remarks toward refugees. He also refuses to help Rick & Co. form an army to take down Negan and The Saviors. Thankfully, other members of the Hilltop Community don’t care what their spineless leader thinks and offer to help. Jesus then tells Rick there’s another community that can help them—and it’s ruled by a king. Rick & Co. arrive at The Kingdom, where they are (understandably) perplexed at the pseudo-monarchy and affected language of both its inhabitants and its leader, King Ezekiel. They are also (understandably) shocked to discover that Ezekiel has a pet tiger. Unfortunately, their attempts at persuading Ezekiel to join the war effort don’t go over very well. For starters, Rick’s story about the rock in the road (based on an old English fable) makes for a weak argument. Any government official who knowingly screws up traffic and road safety for the sake of a social experiment deserves to be kicked out of office. Morgan certainly didn’t help matters, either, advocating that they should attempt to capture Negan instead of killing him. Ezekiel also wasn’t pleased that Jesus had revealed The Kingdom’s dealings with The Saviors to a group of outsiders. Still, the good king said he would think it over, but his tone of voice certainly wasn’t promising. Also, did anyone notice how quiet Shiva was with all those new people in the room? That is one exceptionally well-behaved tiger. Remember that kid from the Kingdom who we all pretty much assume is going to die soon? Here’s one reason: He’s dumb enough to try to sneaking up on Carol–and just to to bring her supplies. It’s a nice gesture, but he’s lucky she didn’t make him “look at the flowers” through both barrels of her shotgun. Later, Ben tries to talk Ezekiel into joining forces with Alexandria. Unfortunately, he ultimately decides against taking the risk, though he does offer Daryl asylum so that he can hide from The Saviors while also keeping Alexandria from retribution for his escape. Yikes. Not only is that incredibly harsh, but also completely disgusting if you don’t know the context. I guess the dramatic head nod those two gave each other last episode has already been forgotten. Back on the road, Rick & Co. find a super-conveniently placed stash of explosives. As if that weren’t fortunate enough, it turns out that Rosita is an expert in diffusing small talk and bombs. As they gather the newfound weaponry for themselves, a horde of walkers slowly lumbers toward them…kind of. I swear, its like they went from 200 yards to 200 feet in less than a minute. As if that weren’t bad enough, Jesus’ radio picks up Negan squawking about how a team of Saviors needs to go to Alexandria and start hunting for Daryl. This leads to a series of utterly stupid actions, which somehow culminates in one of the most badass zombie killing methods I’ve ever seen. Maybe having Rick and Michonne run a fatal close line across a massive horde of walkers wasn’t entirely necessary, but it sure did look cool. 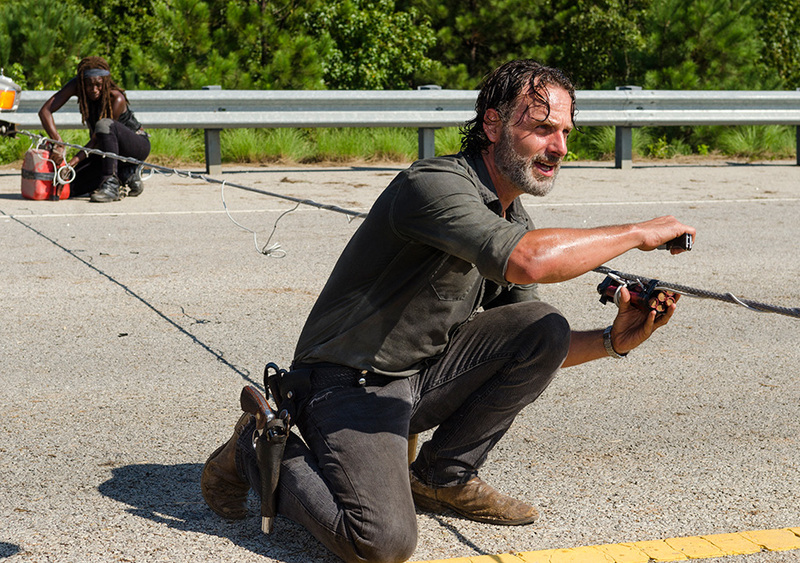 Afterward, Rick and Michonne get out of the car, where they are still surrounded. Thankfully, these walkers only seem interested on aggressively patting them on the back and shoulders rather than biting. Rick and Michonne dive into the van with their friends and drive off toward their soon-to-be besieged home. The group gets back to Alexandria just in time to watch The Saviors show up and start acting like douchebags while they search the premises for Daryl. (In case you’d somehow forgotten, the Saviors are bad people). When they find all the food shelves devoid of canned goods, Rick & Co. are as perplexed as they are. After The Saviors leave, the group begins to speculate about why Gabriel stole their food and left. Everyone comes to the reasonable assumption that he totally bailed on them except for Rick, who claims that it’s not something Gabriel would do. Seriously, Rick? You don’t think the guy who let his congregation to die while he hid in fear and tried to covertly sell you out once before wouldn’t have at least a slight propensity for self-preservation and/or betrayal? But I digress…Rick & Co. find one of Gabriel’s journals with the word “BOAT” scrawled on the inside. This leads them to believe that he’s headed to the same boat Rick and Aaron found a few episodes back. You’d think Gabriel might have given them a bit more to go on, especially since he had time to clear out Alexandria’s entire food stockpile, but where’s the fun in that? As they head out to search for their missing cowardly compatriot, the group is confronted and surrounded by a group of well-armed and scary looking survivors. Rick smiles. He’s finally found his army—if they don’t kill him first. Well, it certainly wasn’t terrible, which is definitely a step up from where we ended things last year. This was by far the most tolerable Rick has been in three seasons—and not just because he managed to smile twice. He also looked and acted like a leader again, a fact made prominently evident by the emotionally volatile behavior of those around him. And that steel cable zombie slaughter was all types of cool. Otherwise, though, this was a fairly forgettable episode, especially for a midseason premiere. I’ve given up being mad about the plot contrivances (like random unguarded weapons/explosive caches), but the story continues to spin its wheels, stuck between constant reminders that The Saviors are evil and that no one wants to fight them. I’m sure things will change with the introduction of this other random group—which somehow stayed hidden despite being extremely large and close to Alexandria—but until then, we’re still on a collision course for this being the worst season of what used to be a great show.